Writing history can be a significant challenge. The historian was not present to record events as they occurred in the past. What sources of information are available and trustworthy? Twenty-first century historical narratives can be constructed based on contemporary press accounts and diaries, but how can an author reconstruct what happened centuries ago? There are secondary sources, of course, but they vary in quantity and quality. Dr. D. A. B. Ronald has done an admirable job of constructing a biography of John Andre, best known to history as the British spy who turned Benedict Arnold from the Continental side to the English army during the Revolutionary War. Andre was one of the most fascinating figures on the British side of the Revolutionary War. Ronald employs a broad spectrum of research sources. Weaving together newspaper accounts, letters, and diary entries, he constructs a narrative with, at times, too many facts. At the same time, there remain gaps in the chronical because of the absence of a pertinent source. For 30 years, Ronald was an investment banker in the City of London, and his facility in the details of finance is evident early in this volume. If anything, his extensive knowledge makes his discussion of Andre’s life before joining the army a bit cumbersome and dry. The pace of his narrative picks up substantially once Andre joins the military. 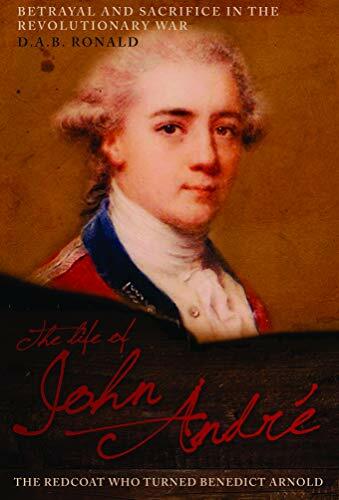 John Andre’s father Anthony had carefully planned John’s life. Banned from France as a family of Hugenots, the Andres came to England in the 1740s. It was Anthony Andre’s strategy that John would ascend to the British patrician class as a émigré by combining wealth, religion, influence, the right schools and marriage. He would start by first learning the family business of banking and finance. Handsome, articulate and gregarious, John Andre found his assigned work in the gloomy “compting house” almost unbearable. By the time he reached 18, he knew he needed to redirect his life. John’s father was infatuated with the East India Company, which led to a disastrous financial catastrophe when the bubble of speculation burst. The absence of resources affected John’s prospects for marriage and career. He purchased a commission in the army. To prepare for his role in the colonies, John pursued further education at Gottingen in Germany, sharpening his language skills and diplomatic maneuvers. He impressed his superiors and the literary types on the Continent. Andre was not a spy—at least, not yet—but he honed the skills he would need when the time came. Andre was stationed in various British-controlled cities in the colonies from Philadelphia to Quebec City. He was captured at Fort St. John in Quebec and imprisoned for a year in Pennsylvania, time he used to further burnish his list of contacts. Exchanged for other prisoners, Andre began to use his skills that proved invaluable as a spy for General Howe and later for General Clinton. He supplied intelligence as to Loyalist sympathizers in areas controlled by the rebellious Americans. When the British troops took Philadelphia, Andre continued to accumulate correspondents and drafted the official military journal of the war from the British perspective. When the British evacuated Philadelphia and returned to New York City, Andre—ambitious as ever—continued to advance in rank. However, the war was failing and Andre sought a “grand stroke” to regain the advantage. It was then that Benedict Arnold fell within his grasp. For most readers, it is Andre’s dealings with Arnold and his new wife Peggy Shippen that would draw the greatest attention. Regrettably, that story does not appear until Chapter 25, 184 pages into the text. Dr. Ronald captures the mutual frustration of the negotiations between the “venal, egotistical” Arnold and the erudite, ambitious Andre. We are left in the dark concerning Peggy Shippen’s precise role. Was she an instrument of Benedict Arnold, John Andre, or both? Before Arnold would turn, he insisted on meeting Andre in person. Arnold’s perfidy would know no end. He trapped Andre in the process while escaping himself to a British man-of-war moored in the Hudson. Andre confessed all in a letter to Washington but did not name his betrayer, which would have been “dishonorable.” He was quickly convicted of spying by a military tribunal—Andre called no witnesses and offered no evidence—and was hanged at age 29. Dr. Ronald suggests that Andre chose to sacrifice himself to protect his personal honor and Peggy Shippen. One fascinating aspect of Ronald’s text is that it is written from the British perspective, rarely the case in literature about the American Revolutionary War. That does not mean the British prevail in Ronald’s version of events. He is not writing propaganda, but a thorough piece of nonfiction.